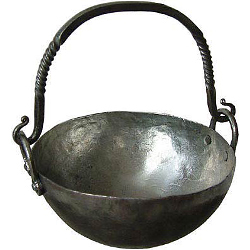 This Medieval Caldron is historically accurate and shaped correctly. Hand forged and shaped from wrought iron, this cooking pot will hold about 2 quarts of liquid. The cauldron is also available in a 2-gallon size for larger groups and Medieval Feasts. These caldrons can be used for period cooking and will satisfy the needs of living history groups as well as re-enactors and collectors. Please allow 4-12 weeks for delivery.